Welcome home to the newest building in the park! Built in 2005, this turnkey double-wide has high ceilings, large kitchen with new appliances, living room, spacious master suite, laundry room with washer and dryer included, guest bathroom, as well as two extra bedrooms. You will find comfort with air conditioning, an evaporative cooler, dual pane windows, AquaPex plumbing, and beautiful flooring throughout the home. Outside is a nice covered deck and separate storage shed. Located on the edge of the park and adjacent to the Oakhurst Community Center, you are just steps away from the Sierra Senior Center, and the local ballpark to enjoy an afternoon baseball game. 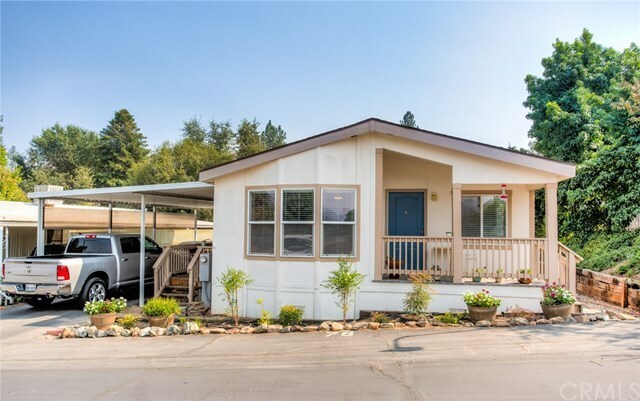 Conveniently located in senior living Oakhurst Mobile Home Estates, you are just minutes from downtown as well as close to recreation at Bass Lake and Yosemite National Park. Come see this one today!